This dish from Gordon Ramsay is not only delicious you can also prepare it the day before and then finish cooking it in the oven . 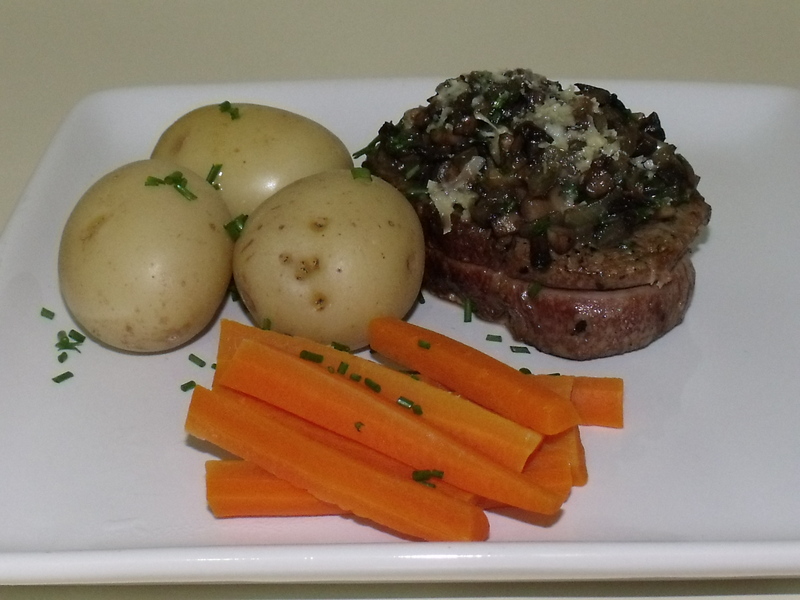 I seal the steaks, make the mushroom mixture and then top the steak with the mushroom mix and refrigerate. The next day I take the steaks out of the fridge for about 10 mins before putting them in the oven for 10 mins or until done to your liking and serve. I served this with steamed carrots and boiled potatoes. I just used button mushrooms cause I can always find them. 2. Place the new potatoes in a large pan and fill with cold water to cover. Add a generous pinch of salt, partially cover with a lid and simmer for 15-20 minutes until the potatoes are just tender when pierced with a skewer. Drain and refresh under cold, running water. Halve the potatoes and pat dry with kitchen paper. Set aside. 3. To prepare the topping, gently sauté the shallot and garlic in 1 tablespoon of olive oil for about 5 minutes until nicely softened. Add a further 2 tablespoons of olive oil and sauté the mushrooms over a high heat, stirring frequently, for about 7 minutes until browned and cooked. The mixture should be quite dry. If necessary, tip it into a sieve to drain off any remaining liquid. Remove the garlic clove and transfer the mushrooms to a bowl, allow to cool. Whip the cream until softly stiff. Fold in the mushrooms along with the egg yolk, herbs and a tablespoon of the grated Parmesan, then season with salt and pepper. Set aside. Season the steaks all over with salt and pepper. Heat a large non-stick frying pan until you can feel a strong heat rising. Cook the steaks for about 2-3 minutes, turning them to seal all over. Remove from the pan. Put the steaks on a shallow baking tray. Pile the mushroom mixture on top of the steaks and dust with the remaining parmesan. Cook in the oven uncovered, for about 5-7 minutes until the topping is bubbling and golden. Meanwhile, finish off the potatoes. Heat the olive oil in a frying pan and add the garlic and rosemary, followed by the potatoes. Sauté over a fairly high heat, until the potatoes are golden brown – stir throughout to prevent them sticking to the pan. Add a knob of butter towards the end of cooking, season generously with salt and pepper.